Most nights Karlie sleeps very well in her new "big girl" bed but occasionally we find her in some pretty funny, yet worrisome positions. During the night, we put a gait across her doorway but any unsupervised time can be dangerous even in her bedroom. This is how i found her the first morning after she had slept in her new bed. I think she rolls over in her sleep and her legs fall out of bed. Once she gets down on her knees, i don't think she's able to get back up into bed and lay down. This is a skill that's extremely hard for Karlie to manage while she's wide awake little lone half asleep. Lately the weather here has been beautiful and we're very excited that tomorrow is the first day of Spring! We've been taking evening walks and Karlie loves being outside! Here's a pic from our walk yesterday. Happy Saint Patrick's Day! This picture doesn't do justice to the beauty of glistening snow but i love it when the ground looks like it's covered in sparkly glitter! I wanted to bundle her up and let her get out in it but she had been so sick that i didn't want to take a chance. This is more than a week after the snow and ice hit Southern Indiana and Kentucky. Millions were without power for weeks afterward with both areas being declared States of Emergency. Trees and power lines wore thick, heavy coats of ice. Thank God, our power never failed! Emmaleigh LOVES making snow angels! This was day two of our snow and ice storm at the end of January. Six inches of snow fell, followed by three inches of ice on the first day. By the next morning we had four more inches of snow and another blanket of ice. With tempertures lingering below zero, the white stuff hung around for two weeks. Good times! She has been doing pretty well with sleeping, though her days and nights have always been a little mixed up. We still give her melatonin but even that doesn't always work. Last night we were driving around at 3 am just so she would stop crying and go to sleep? Maybe that's not so unusual? I just know that i'm tired, i’m sick of having strep throat and today i’ve been a big crybaby. Sort of one of those days where once you start crying, you think of every crappy thing that’s happened in the last few months that have been out of your control. Kind of been crazy since Jon was laid off, the engine in his truck blew up, we were snowed and iced in for two solid weeks (major cabin fever), we have a $320 electric bill past due with another high one coming soon, my Grandma is in the hospital in heart failure, not to mention everyone in my house has been sick at different times....blah blah blah. Could be better, thank God it’s not worse. Ok, ok...enough of my whining! I have soo much to be thankful for and need to focus more on the positive things. Please drop us a quick note and let us know that you're reading. My goal is to blog much more often! Rett Syndrome (RTT) is a neurological disorder seen almost exclusively in females. The prevalence of Rett Syndrome in females is approximately one in every 10,000 - 23,000 births and is found in all racial and ethnic groups worldwide. It is known that Rett Syndrome can occur in males but is extremely rare. It is named for Dr. Andreas Rett, an Austrian physician who identified the syndrome in 1966, although it remained unknown in the United States until 1983. Rett Syndrome symptoms generally appear in most females between 6-18 months of age. Development to that time can be somewhat normal. The child then enters a period of regression, losing the ability to speak and all purposeful hand use. Most children develop repetitive hand movements, irregular breathing, seizures, motor-control problems, heart irregularities and autistic like symptoms. A slowing of the rate of head growth also becomes apparent. Many of these symptoms are common by age four. Most researchers now agree that Rett is a developmental disorder rather than a progressive, degenerative disorder as once thought. Some symptoms may be medicated with prescription drugs but no cure or truly effective treatment currently exists. Nearly 5,000 girls and a growing number of males in the United States are waiting. A new study appearing in the February issue of the Proceedings of the National Academies of Sciences, researchers showed that daily injections of an active fragment of IGF-1 in mice that expressed Rett-syndrome like symptoms could significantly reduce movement and respiratory irregularities. Although treated mice were not cured, the outcome is reason for optimism. "This is the first realistic way for a drug-like molecule injected into the bloodstream to relieve Rett syndrome symptoms," says Whitehead Member Rudolf Jaenisch, whose lab collaborated with the lab of MIT and Picower scientist Mriganka Sur in the research. In approximately 85% of girls with Rett syndrome, the disease is caused by loss of function of the MeCP2 gene, which is highly expressed during nerve cell maturation. Lack of MeCP2 expression impedes nerve cell growth, keeping the cells from forming projections, called spines, which are used for nerve-cell-to-nerve-cell communication. Recent genetic studies have shown that in mice with blocked MeCP2 expression, turning MeCP2 back "on" nudges the mice towards normal movement and lifespan—an indication that the disease could be reversible.Although researchers have known which gene causes the vast majority of Rett syndrome cases, they have until now been unable to promote nerve cell maturation through administration of a drug, protein, or small molecule.While researchers in Sur's lab had discovered that increased brain levels of IGF-1 promoted maturation of synapses, the connections between nerve cells that are the basis for brain functions, Emanuela Giacometti, a graduate student in Jaenisch's laboratory, was theorizing that IGF-1 might also increase the nerve cell spines in the lab's mouse model of Rett syndrome. Such mice lack the MeCP2 gene and at four to six weeks display symptoms quite similar to those in girls with Rett Syndrome, including difficulty walking, lethargy, and breathing and heart rhythm irregularities.In a collaboration with the Sur lab to test how IGF-1 might affect these mice, Giacometti administered to two-week-old Rett mice daily injections of IGF-1 fragment. At six weeks, treated mice were significantly more active, had more regular breathing, and had more normal, regular heart rhythms than did untreated mice. In addition, the brains of treated mice were heavier and showed more nerve cell spines. "Although the treated mice get better and their symptoms don't progress as fast as they normally would, the treated mice still get the symptoms. So it's definitely not a cure, but it could be a co-therapy," Giacometti says.Sur is also excited by the prospect of finding a drug treatment for Rett syndrome and other forms of autism. IGF1 is approved by the US Food and Drug Administration (FDA) to treat severe IGF-1 deficiency. "This represents a way forward towards clinical trials and a mechanism-based treatment for Rett Syndrome. We very much hope our research can offer some help for the patients who have this terrible disorder." Beginning on Sunday March 1, 9 PM (EST/PST) and 8 PM (CST/MST) Rett syndrome is going to be getting some national attention when country music superstar Clint Black will be playing for the International Rett Syndrome Foundation on the NBC show THE CELEBRITY APPRENTICE. Clint Black and his brother Kevin (who lost his daughter, Cortney, to Rett syndrome several years ago) have been outstanding advocates and fundraisers on behalf of IRSF over the last several years. IRSF has been so grateful to them for all their hard work and generous support on our behalf! Please stay tuned to the IRSF website to learn how you can leverage this exciting, high-profile exposure about Rett syndrome to raise even more awareness in your city. We will be providing you with a mini-"How-to" guide to talking to your local TV channels and newspapers about Rett syndrome. In the meantime, start spreading the word to friends and family and colleagues about THE CELEBRITY APPRENTICE on NBC beginning March 1st. Lately Karlie has been having a tough time at school. I'm not sure what the problem is other than she just doesn't want to be there! She tends to start screaming as soon as we pull into the parking lot and doesn't stop until we leave. She's been attending four days a week for almost three hours at a time but now she stands by the door and cries. Her therapy visits aren't any different. Last week her Physical therapist and Occupational therapist suggested that we cut down on our visits. They basically don't know what to do with her since she's so unhappy. Now we'll be seeing them on a consult basis once a month, rather than once a week. Our Speech therapist moved to Colorado in November and a replacement isn't expected until May. So in almost two years time we've went from 7-11 therapies a week down to OT and PT once a month. This is a HUGE difference that worries me with regression but I'm ready for a break too! Since tax time is around the corner, I've started adding up our deductions for travel due to therapy. Last year Karlie attended 223 therapies. That adds up to 7607 miles and I'm not finished calculating yet. I hope we'll be able to take our first family summer vacation with this unexpected money. We won't go far from home but we all need to get away and have a little fun! Here's a pic of Karlie in her new helmet. We've been waiting for it since June so I'm just glad it's finally here. She's had so many nasty bumps on her head maybe now we can prevent a few. Three weeks ago we decided it was time for the girls to have their own bedrooms. Emmaleigh is 8 and beginning to want some privacy. It was also really unfair for her to wake up in the middle of the night because of Karlie's screaming. Both girls LOVE their new rooms and their own space. Karlie has been attentive to toys she hasn't looked at in years. Now we're looking into padding the walls so we can take her helmet off yet she can be safe in her new space. We're open to suggestions since my idea is rather pricey. 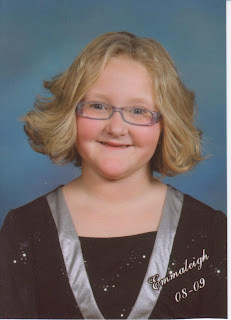 Before Emmaleigh started school we found out she had severe eye problems. Her lenses are are shifted out of place in both eyes and have probably always been that way. The concern is not only will she have to have eye surgery in the future but lens and retina detachment are common in people with Marfan Syndrome. This is a genetic connective tissue disorder. Connective tissue is all throughout our bodies so many areas can be affected. We had Em tested and she does have a mutation that is associated with the gene that causes Marfans. We don't however have anyone to compare her mutation to since she's the only one ever reported with it. Her heart and vessels, lungs, skin, dental and skeletal system could all be affected. Only time will tell but we're praying only her eyes have been affected. I'm not looking for pity by sharing this I'm only asking that you include her in your prayers. She's an amazing kiddo who makes straight A's and A+'s along with being a terrific sister! With all the fuss about Karlie, she handles it so well and even tries to educate others.